The capital city of Madhya Pradesh, Bhopal is one of the fastest-growing and smart cities in India. With its history dating back to the 11th century, it is also one of the oldest-surviving places in Madhya Pradesh. Hence, you can find several places of interest in and around the region Bhopal. Ranging from mosques to churches and tombs to caves, there are numerous historical places in Bhopal which are visited by thousands of tourists every year. Did you know Bhopal also houses myriad natural places in the form of forests and lakes? One such marvel is Van Vihar National Park, which is one of the richest areas in the state housing innumerable species of plants, animals, birds and reptiles. How about visiting this wonderful world of rich biodiversity? Spread over an area of around 5 square kilometres, Van Vihar National Park is one of the unique national parks in India as there are several roads built throughout the park which allow visitors to roam around and witness the rich wildlife of Van Vihar National Park easily. Hence, it has become a zoological park today and one can easily access the different corners of this beautiful park. Van Vihar National Park has been conserving in situ and ex situ wildlife since its formation. Today, you can find hundreds of species of plants and animals living in this mesmerising park. However, carnivorous animals live inside the enclosed areas while herbivores are left to wander openly. Van Vihar National Park captured the frame and was declared a national park in 1983 under the Wildlife Protection Act as this area was filled with lush green vegetation with the presence of a beautiful lake, which in turn, was alluring several commercial organisations to prehend this beautiful piece of Bhopal and convert it into a profitable land. However, the committee of experts, appointed by the government of Madhya Pradesh, decided to reserve this land to retain the authenticity and conserve the wildlife of the area. Later on, private land near Van Vihar National Park from villagers was bought and added to the existing area. Today, this area is home to several endangered species of plants and animals. The beauty of Van Vihar National Park lies in its rich biodiversity and scenic beauty. The presence of small waterbodies adds to the existing charm of the park. At the time of dawn and dusk, the appeal and grandeur of Van Vihar National Park is at its summit as the colourful rays of the sun ornament its green grass and beautiful trees. The dazzling of small lakes present within the park is something which should be photographed and preserved as a memento. The rich wildlife in the form of animals like Bengal tiger, sloth bear, Asiatic lion, wild dog, red fox, cheetal, blue bull and red monkey and birds like cinnamon bittern and long-billed vultures is the centre of attraction. You can also spot several beautiful butterflies, fishes and turtles in Van Vihar National Park. Apart from loitering around the rich plains and walking through the beautiful aisles of Van Vihar Bihar National Park, you can also explore the surroundings of Bhopal which are filled with several historical as well as natural marvels. From mosques to lakes and caves to temples, there is a lot which can interest you in the city of Bhopal. The major places which you must not forget to visit when in Bhopal include Upper Lake, Taj-ul-Masajid, Birla Mandir, Bhimbetka Caves and National Museum of Humankind. 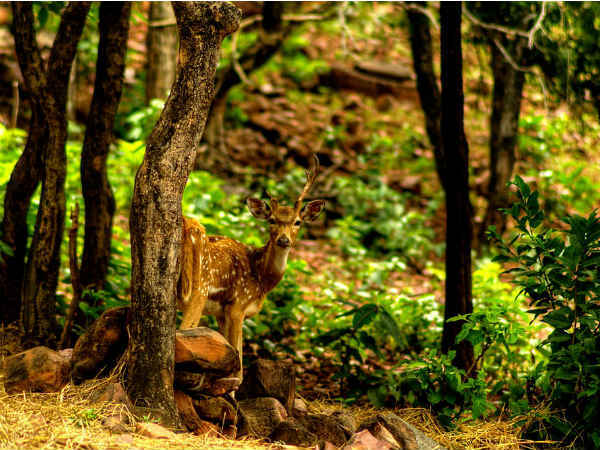 As the summers are hot in the city of Bhopal, it is wise to avoid visiting Van Vihar National Park during the summer season. If you are planning to witness the lush green beauty of the forests and vegetation at Van Vihar National Park, then the best time is from October until the end of April. By Air: You can take a direct flight to Bhopal airport. Once you have reached the airport, you can hire a cab to Van Vihar National Park, which is located at a distance of around 15 km. By Rail: There are direct trains available to Bhopal. From the railway station, you can take a cab to Van Vihar National Park. By Road: Being located in the city of Bhopal, it is easily accessible by road.